The Supertow I gently rolls under the nose or tail wheel locking the tire in the Lazy Susan carriage, allowing the aircraft to be turned in its own wheel radius for precision hangaring and maneuvering in tight situations. The nose wheel faces forward while the tug rotates under the aircraft eliminating nose wheel stop limit over travel. Powered with the United States built Briggs and Stratton engine, the Supertow 1 has ample power to move up to 8000 pounds on level, smooth surfaces. Electric push-button start, on-board charging and head light are all standard features. Features the original patented aircraft self-loading "Lazy Susan" preventing over travel of stop limits. All Controls at the top of handle allowing one hand operational control. The Same robust design and features of the Supertow II & III. 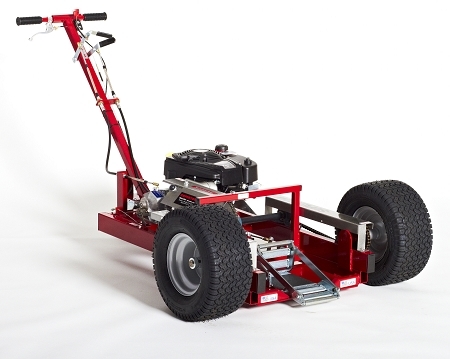 Supertow I is lightweight, maneuverable, compact machine. Ideal for singles, tail draggers (Without Wheel Pants), and medium twins such as B-55 Baron, Cessna 310, Piper Twin Comanche etc. Shipped In one wooden crate. Approx. 400 lbs. Shipping charges have to be calculated manually.. You will be notified of shipping charges prior to finalization of sale.. Very well made product that does exactly as advertised. Handles my Baron 58 with no problem. Have used a PowerTowEZ for 7 years. Moved up to a Saratoga. Needed a little more "power". The SuperTow I certainly delivers! Construction very sturdy, appears as if it belongs on a commercial ramp. Assembly requires basic mechanical skills. Functions as described, the turntable is very easy to use. No cables required. I purchased the Supertow I tug for my ’74 Baron 58 and am very happy with it. The unit starts right up with the push of a button (ok, it’s new so I would hope so), drives right up and scoops the nose wheel into the cradle and is ready to move with no additional action. I love the Lazy-Susan design as it makes maneuvering extremely easy without fear of exceeding the turn limits of a tow bar on a tug. I have found that I can leave the plane on the tug, turn the tug 90 degrees and close my hangar door, ready for the next time I come out to the airport. When I pull the plane out, again it is easily maneuverable to where I want to position the plane, pull the disengage lever and the nose wheel rolls right out where I want it. I’m extremely happy (almost giddy) with this investment. I am very satisfied with my Supertow 1. My back is especially happy with it. I use it with a M20J Mooney and a Boeing Stearman E75. Works great on both nosewheel and tailwheel. The Supertow 1 aircraft tug is perfect for moving my Bonanza in and out of the hangar. It makes the job effortless, despite having to get the aircraft over a lip and slight incline to enter the hangar. Even more impressive is the customer service this company provides. I am not the original owner of this older Supertow 1 and when I ran into a problem with it, I emailed Northwest Mfg late on Sunday night. First thing Monday morning, Ron Pasco called me from the factory and spent a generous amount of time walking me through the steps to resolve my issue. It is very unusual to find companies today that offer this level of customer service, particular to end-users that are not the original owner or when the unit is out of warranty. This is very impressive customer service. And yes, the Supertow 1 is fantastic! I couldn't be happier! Keep up the great work!